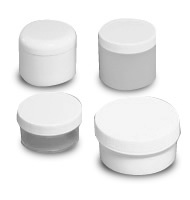 Short, low-profile jars are available in three sizes. Choose from white polypropylene or clear polystyrene. White plastic caps are included.